Up until recently, AT&T customers had some limited Android offerings to choose from as a good chunk of them swayed slightly from providing the true limitless possibilities that other carriers have experienced with the platform. 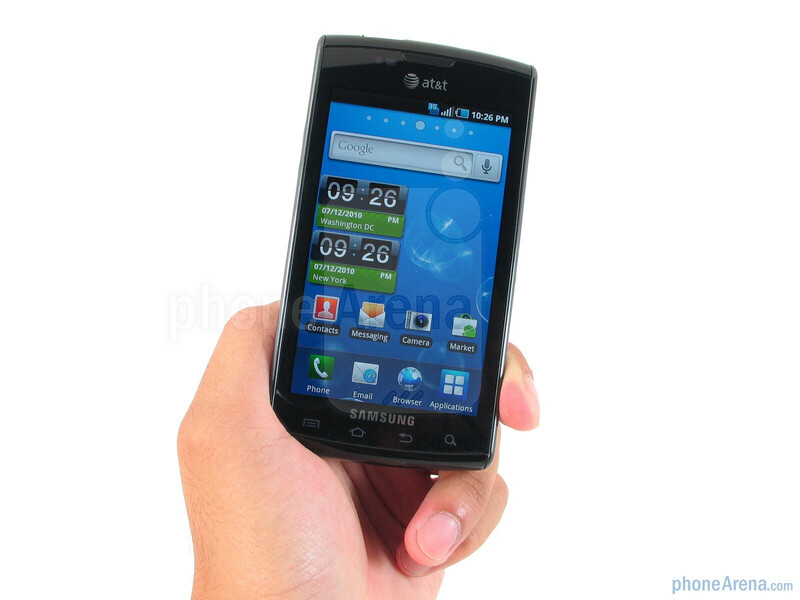 Littered by mostly mid-range Android sets, the only one to test the high-end waters was the long awaited version of the Nexus One especially compatible with AT&T's 3G bands. Still, customers couldn't simply purchase it by walking into a retail store. Тhankfully, they're soon going to scoop up a premier offering from Samsung. 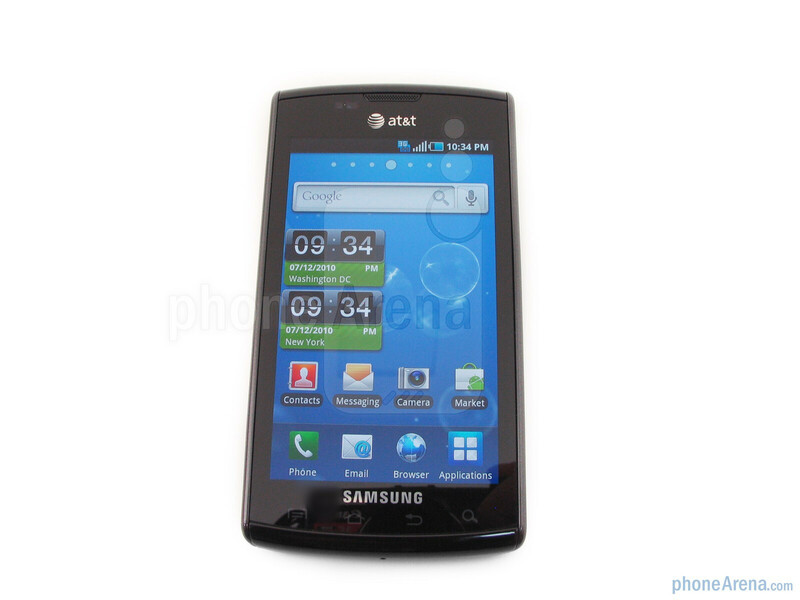 Being one of the many Samsung Galaxy S smartphones being launched simultaneously in the US market, the Samsung Captivate I897 will definitely bring Android's full glory into gear for AT&T's customers who have longed for a full figured device that kicks things up a notch. What's most interesting about the Captivate's launch is if it'll be successful in mustering up a decent following to attract customers who want to experience something refreshing. The most satisfying part about this version of the Samsung Galaxy S over its other contemporary brothers and sisters is the fact it's one of the more aesthetically pleasing devices. 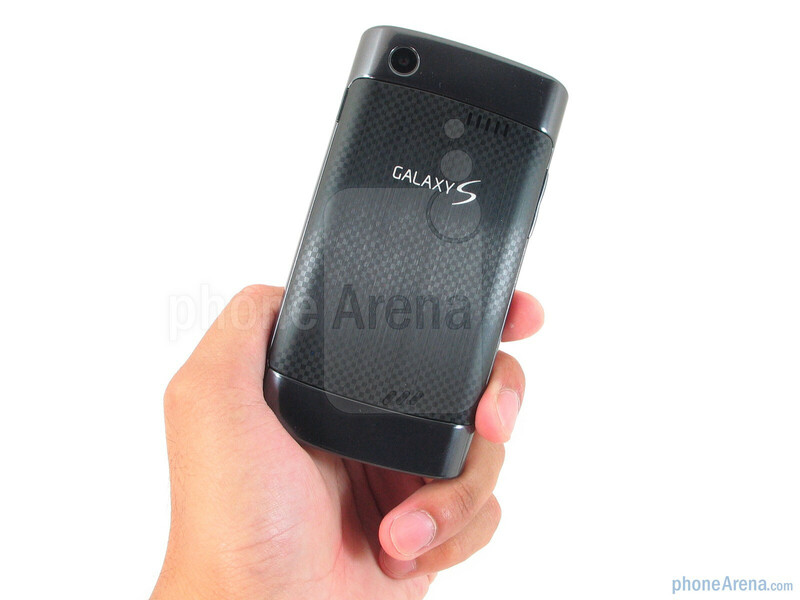 Rather than following closely to the original GSM version, this one actually has more in common with Samsung's first bada handset – the Samsung Wave. While it's constructed mostly out of durable feeling plastic, the metallic back cover with a carbon fiber pattern adds an element of pristine workmanship that naturally make it feel well constructed. 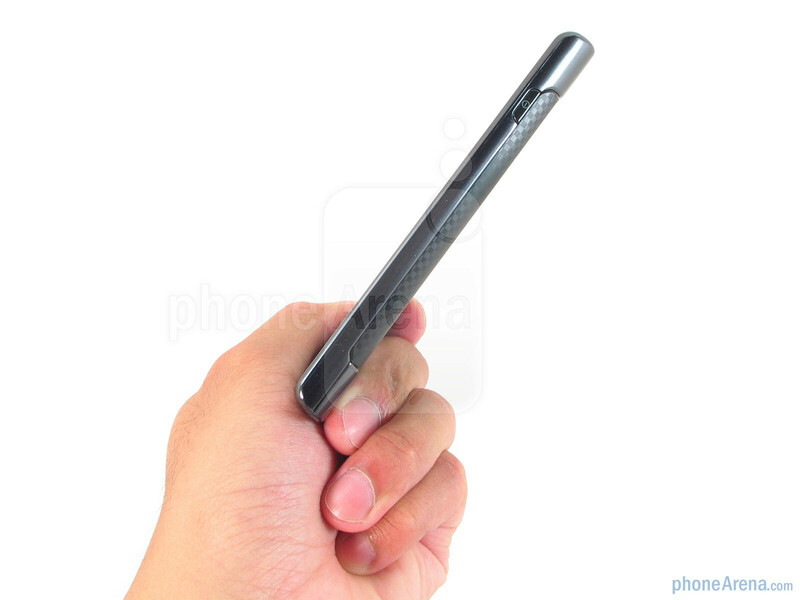 At the same time, it's one slim (0.41”) handset that will slip inconspicuously into a pocket – plus you don't even notice the weight (4.41 oz) when holding in the hand. As a whole, it may not be something strikingly innovative in terms of design, but we're still content with it nonetheless. 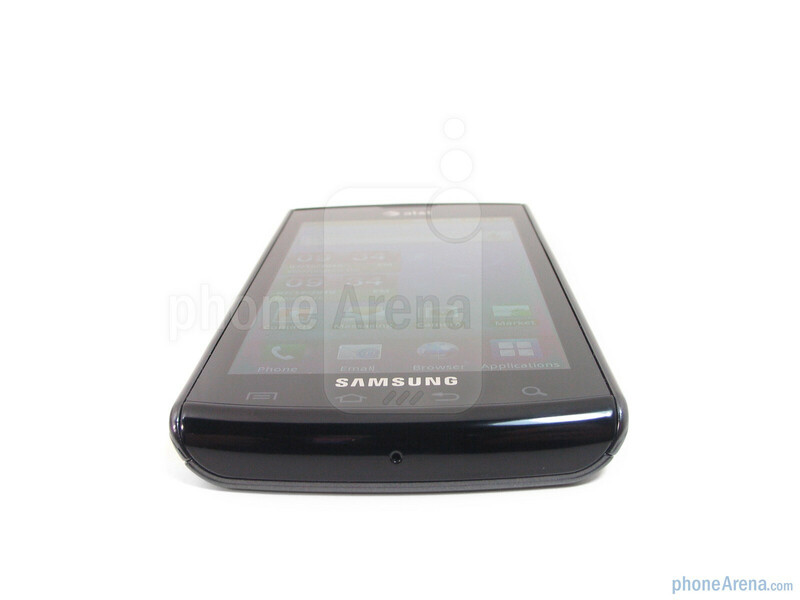 Super AMOLED displays are abundant in Samsung's arsenal (tell it to those with Droid Incredible orders) and the Captivate retains the same exact one found with the original. Sizing up with a healthy 4” Super AMOLED display at WVGA resolution and support for 16.7 million colors, we found it to be truly awe-inspiring as everything just pops with the utmost best contrast ratios that create pure black level. Every color under the rainbow is saturated and full-bodied as the display is quite manageable in displaying various gradients and tones to make them distinctive. In the Captivate's case though, the utilized 480x800 pixels resolution seems to be not high enough in order to provide great screen clarity, thus smaller text looks somewhat jagged at times. Luminance remains to be consistent at every viewing angle as it does not falter one bit, however, using it outdoors in direct sunlight still exposes its Achilles Heel – although it's an improvement over AMOLED screens, we still needed to shade it. 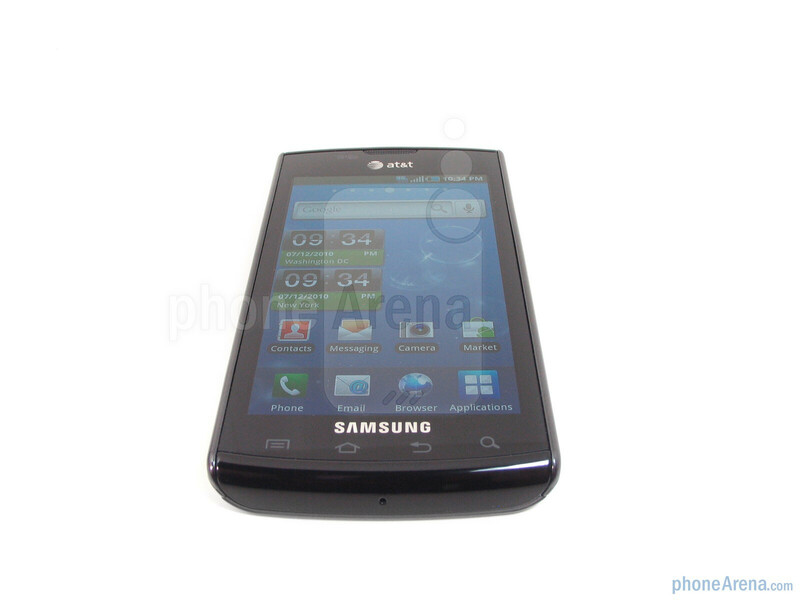 In order to make the front surface of the Samsung Captivate uniformly flush, Samsung opted to include the usual set of four touch sensitive buttons – menu, home, back, and search. Luckily, there's enough spacing between the buttons and the bottom most portion of the touchscreen to minimize any accidental presses. There aren't that many physical buttons clinging onto the phone, but you'll naturally find the volume rocker and power button to offer a slight response when pressed. On the top edge of the phone, the 3.5mm headset jack is located where it's normally found while the microUSB port is hidden behind the plastic sliding latch which will keep out unwanted debris from messing with its internals. 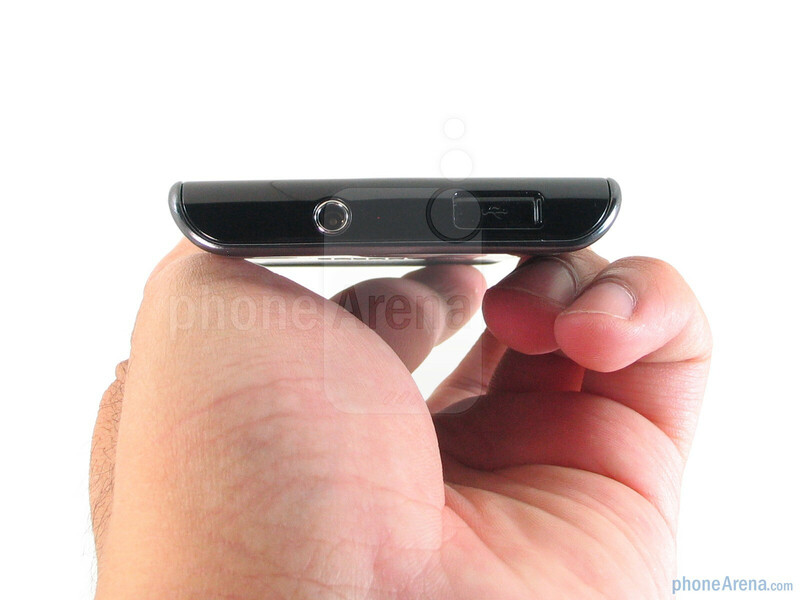 Flipping over to its rear, the 5-megapixel auto-focus camera is found on the upper left corner while the speaker phone is placed in close proximity. 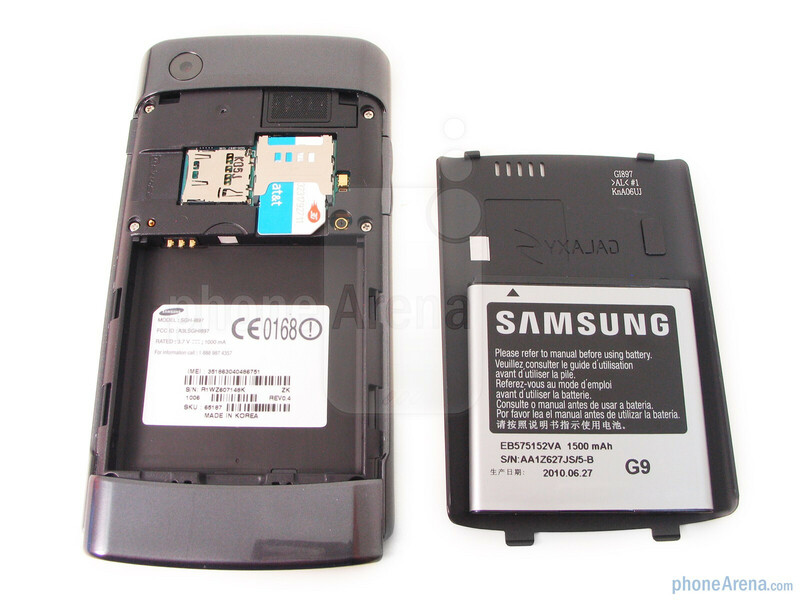 You'll need to pull down the bottom frame in order to unhinge the metallic back cover which houses the battery, SIM card slot, and microSD slot. wow really and you only have 2 cons and you give it 8.5. Nice thanks I see how you do it now. If I stuck an Apple sticker on the phone, would that make it 9.5 too? nak, good point, seems like veryone has ok call quality - I bought the HTC ARIA - AT&T - and it has great call quality - I usually ignore the call quality part of the review and focus on ease of use...I am tempted to trade mine in as it is under 30-days....but, I prefer HTC over SAMSUNG....soon HTC will have a super phone on the AT&T network and I will get it next year. I would do it, this phone looks great. The only true con of this phone is its on the same network as the iphone. Nice to see that a phone with so many pros and only 2 cons still manages to score below a phone that CANT EVEN MAKE PHONE CALLS! in your eyes. I used to respect phonearena's scores, but even as much as I hate ATT, this review pretty much sold me on finding a less bias review site. So where does your comment fall: something I read and shouldn't believe? or something I read and should take it with a grain of salt? 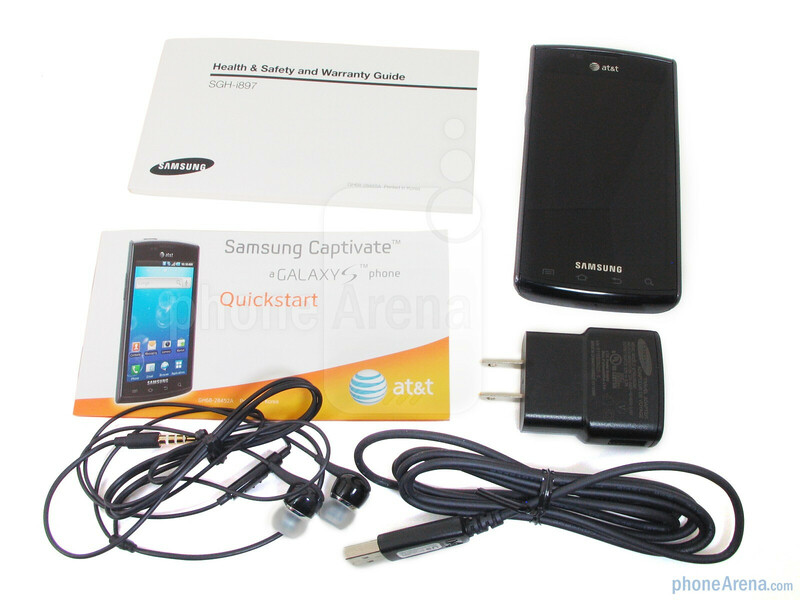 well i was just wondering if an unlocked version of the captivate is/going to be available without the AT&t bloatware? i am on at&t and really like these phones. You can easily root the phone and uninstall all the ATT bloat with Titanium backup. Just search on XDA and it will give you an exact list of whats okay to delete. 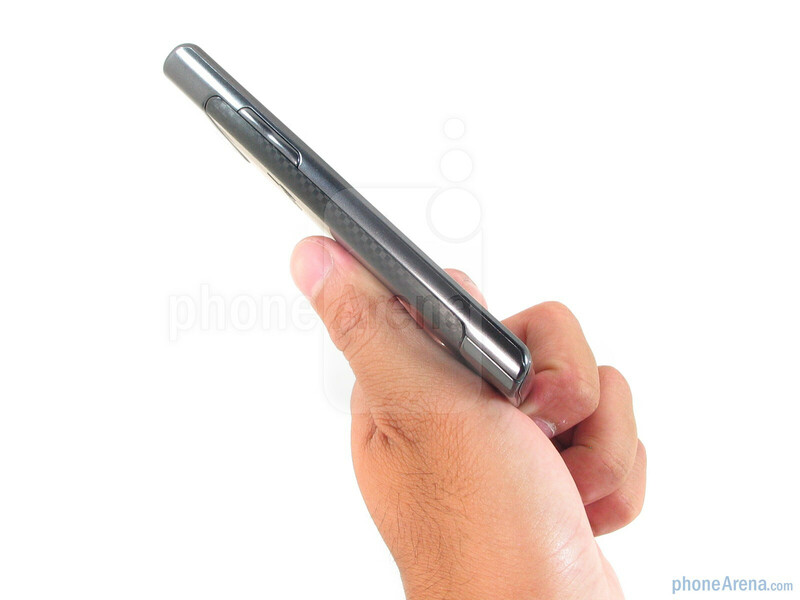 Maybe it's not such a big deal and maybe I'm the only one who noticed, but when phone arena mentioned about the Write and Go feature on the Samsung Captivate they didn't even use the Captivate; notice how there are only 4 signal bars when the captivate has 5. I personally don't care too much if the call quality is average. cuz that doesnt mean that you can't hear the other person and it shouldnt be a deal breaker for this awesome fone. also mediocre pix not too big a deal either in my opinion. if i wanted to take a photo of something that bad i would get a camera.